COLLEGE NIGHT - Docent Kestrel Lemen (right), a senior art major from Lincoln, engages students with the question, "For something to be art, does it have to be made?" 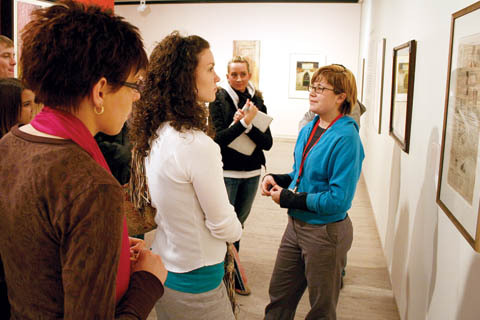 The students were among 140 who attended the first College Night Jan. 22 at the Sheldon Memorial Art Gallery. The next College Night is 5 to 8 p.m., Feb. 13. Author John Updike says, "Art museums are endlessly entertaining, but they are more than entertaining. They're a kind of a superior version of reality." Clyde Prestowitz, founder and president of the Economic Strategy Institute, will present the Lewis E. Harris Lecture on Public Policy at the Feb. 8 E.N. Thompson Forum. The State of Nebraska is a maverick in the field of K-12 education. Students across Nebraska are learning about science, technology and engineering with their own personal tutors - robots. "I've fired hundreds of guns. And that was just during my first few months on the job." Theatrix, the student theatre organization in the Johnny Carson School of Theatre and Film, opens the spring season Feb. 8 with the student original, "Date Auction." Violist Jonathan Crosmer, a graduate student in the School of Music, is the winner of the "Play with the Chiaras" competition. "The Producers," a Mel Brooks musical, will make its Lincoln premiere at the Lied Center for Performing Arts, Feb. 9-11. Performances are 7:30 p.m. Feb. 9; 2 and 7:30 p.m.. Feb. 10; and 1 p.m. and 6:30 p.m. Feb. 11. Exotic music, brilliantly colored costumes and authentic Eastern European folk dancing takes to the main stage of the Lied Center for Performing Arts when the Hungarian State Folk Ensemble performs at 7:30 p.m. Feb. 7. "Black Gold," opening Feb. 2 at the Mary Riepma Ross Media Arts Center, is an eye-opening account of the winners and losers in the global coffee trade. "Black Gold" is showing through Feb. 8. An exhibition featuring the art of Valerie Bender opens Feb. 5 at the Office of the Dean of the College of Arts and Sciences, 1223 Oldfather Hall. School of Music graduate student Jacob Thomas is scheduled to be on the Emeril Live TV show at 7 p.m. Feb. 11 on the Food Network, channel 58 on Time Warner Cable in Lincoln. The show will be broadcast again at 2 a.m. Feb. 12. The Lied Center for Performing Arts is accepting applications from area artists interested in performing for the 2007-2008 Free at 6 series. Lincoln's Symphony Orchestra will feature concertmaster Anton Miller as the featured soloist in "Russian Heartstrings," 7:30 p.m. Feb. 2 at Kimball Recital Hall. Grief can endure a long, long time. A deep loss is very reluctant to let us set it aside, to push it into a corner of memory. Here the Arkansas poet, Andrea Hollander Budy, gives us a look at one family's adjustment to a death.